This particular creature has been identified as a "fairy", and even as a "spirit". It is believed that the Banshee has the capability of forewarning individuals of the death of their loved ones, as well as their personal death. Historically, there were only certain families that were believed to be the subject of attention when it came to the Irish Banshee. These are the families who had the surnames of “O’Connor”, “O’Neill”, “O’Brien”, “O’Grady” as well as the surname of “Kavanaghs”. Due to the fact that marriages have occurred, this list has been extended to include other names. In this guide, you will learn many interesting facts regarding the Banshee of Ireland. 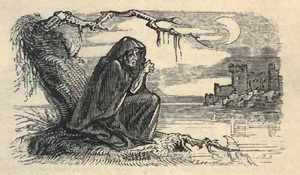 Individuals have described the Irish Banshee in numerous ways. Many describe this mythical creature as a young, beautiful woman. Then, there are some that describe the Banshee as a matron. In some instances, the mythical creature has been described as an extremely hideous "old hag". If you research Celtic mythology, you will find that all three descriptions represent the aspects of what is referred to as the "Celtic Goddess of War and Death". The Banshee of Ireland is typically clothed in a dark colored robe. In this aspect, she is similar to the "Grim Reaper" that is common in the legends of the United States. The clothing seems to represent the fact that she brings forth news of tragedies to be. The Irish Banshee, according to the people of Ireland, may come in the form of one of the animals mentioned above. This is partly due to the fact that the actual female version of the Banshee is not always seen in that form, however, several animals have been said to emit the same sounds as the mythical creature makes when forewarning of tragedy. This sound is called the "Mourning Call". In some cases, no animal or female figure is seen, but the call can be heard coming from the dark, mysterious depths of the forests located throughout Ireland. The Banshee of Ireland is a very interesting legend. All throughout history, there have been accounts regarding the sightings of this mythical creature. Is she real? There is no physical evidence apart from witness accounts and tales passed from one generation to another, but for those in Ireland, this is a very real mythical creature. For the rest of us, it is truly one of the world’s greatest unsolved mysteries.